Not sure if Physio can help? Interested in talking to one of our specialist physiotherapists? What is a Facet Joint? The facet joints are small stabilising joints located between and behind adjacent vertebrae. Their role is to allow the needed amount of mobility to turn, look round and bend forwards and backwards. Why do Facet Joints become painful? The sliding surfaces of the facet joints are covered by a low friction, moist cartilage. This cartilage may become thin or disappear causing the joints to become inflamed. When this occurs, a protective reflex may arise which causes the muscles around the spine to spasm. What is the mechanism of Injury for Facet Joint pain? Most commonly in those with poor posture (slouching) or when lifting or twisting awkwardly as this overloads the joints. It may also be a result of a twisting injury in which the cartilage in the joint tears which then limits mobility by forming a block in the joint. 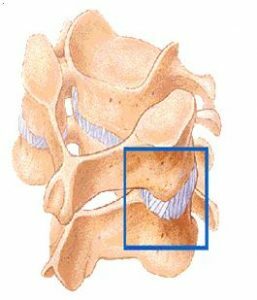 The normal age related ‘wear and tear’ changes within the structures of the spine can also cause irritation around the facet joints. What are the symptoms of Facet Joint pain? Upper back pain when turning is the most painful movement but prolonged postures, bending and sudden movements may be painful. There will be tenderness around the affected joint and you may experience pain spreading into the upper back, chest wall or rarely into the arm. What physiotherapy treatments are most commonly used for Facet Joint pain? When facet joints become inflamed the muscles around the area spasm as a protective mechanism so it is important for your therapist to relax these muscles. Your therapist will also need to advise you on how to prevent the condition from occurring in the future. Massage – Encompassing a variety of techniques and is given with sufficient pressure through the superficial tissue to reach the deep lying structures. It is used to increase blood flow, decrease swelling, reduce muscle spasm and promote normal tissue repair. Mobilisation – Is a manual technique where the joint and soft tissues are gently moved by the physiotherapist to restore normal range, lubricate joint surfaces, and relieve pain. Manipulation – Is a high speed, short movement thrust given at the end of available range. It is used to break down adhesions, remove a blockage within a joint and restore full painless movement. A click or noise may be experienced during this treatment. Ultrasonic therapy – Transmits sound waves through the tissues stimulating the body’s chemical reactions and therefore healing process, just as shaking a test tube in the laboratory speeds up a chemical reaction. Interferential therapy – Introduces a small electrical current into the tissues and can be used at varying frequencies for differing treatment effects. E.g. pain relief, muscle or nerve stimulation, promoting blood flow and reducing inflammation. What other treatments could be used for Facet Joint pain? Acupuncture – An oriental technique of introducing needles into the skin to increase or decrease energy flow to promote pain relief and healing. What can you do yourself to help Facet Joint pain? Exercise programme – This is the most important part of the rehabilitation, your therapist will instruct you as to which exercises to begin with, when to add the others, as well as how to progress the exercises. Medication – Ask your GP or Pharmacist for advice on the best medication for your condition. Heat packs – A hot pack may be beneficial in helping the muscles to relax, promote blood flow to the area and provide pain relief. Posture – Good posture enables the muscles of the spine to act as a supporting structure and decreases the strain on the spine. Ergonomics – Ensure all your seating is encouraging good posture and your mattress is supporting your spine adequately. What if physiotherapy does not help or resolve Facet Joint pain? It is very rare that physiotherapy does not give great benefit, in these cases a cortisone or epidural injection may be appropriate and in very extreme cases surgery is a possible option. These options can be discussed with your therapist if appropriate.